Boston University Graduate School of Management, U.S.A.
New York University College of Arts & Science, U.S.A.
3. Baby Web Nursery Website awarded "HONcode Website Certificate"
4. Jen-Ai Hospital Websites awarded "Excellent Medical Website Award"
5. 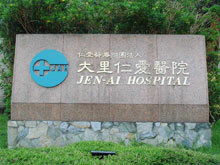 Jen-Ai Hospital - Dali awarded "Excellent Bilingual-Friendly Hospital Award"
6. Jen-Ai Hospital Websites awarded "National Biotechnology & Medical Care Quality Award"
7. Jen-Ai Hospital - Dali awarded "Good English Living Environment Award"
8. Jen-Ai Hospital - Taichung awarded "Good English Living Environment Award"
9. Jen-Ai Hospital Websites awarded "Certificate of HONcode Accreditation"
10. Baby Web Nursery Video awarded "YouTube Show Taiwan Award"
11. International Patient Center Website awarded "HONcode Website Certificate"
12. Jen-Ai Hospital – Dali awarded "Health Promoting Hospital Membership Certificate"
14. Jen-Ai Hospital Websites awarded "Attestation of HONcode Certification"
15. Jen-Ai Hospital Websites awarded 2-year "HONcode Website Certificate"
16. Jen-Ai Hospital awarded "Attestation of HONcode Certification"
2. "3rd Medical Quality Promotion Conference"
6. 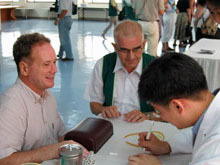 "Taiwan Joint Conference in Health Care 2007"
10. 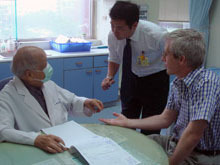 "Taiwan Joint Conference in Health Care 2009"
12. 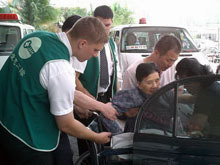 "Taiwan Joint Conference in Health Care 2011"
13. "Annual Conference on International Health Programs – Cross-Sectoral Cooperation and Achievement 2011"